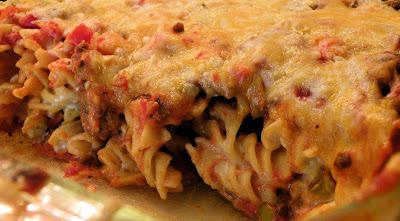 Baked pasta is so yummy, and is a refreshing change from the standard, stove-top spaghetti. I have tried many different recipes, and discerned what I liked and did not like about each one. I will list simple ingredients along with ways to make them a little healthier in parentheses. Combine milk (or water) with soup. Layer ingredients in a casserole dish or baking pan as follows; sauce, pasta, soup, cheese, pasta ... repeat. Or, if you prefer ... just mix it all together and dump it in. Serve with side of garlic bread and steamed veggies for a delicious meal! I'm A Stonyfield Food Superhero!